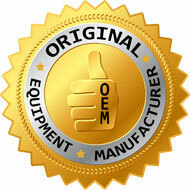 This factory OEM fourteen foot electric hose fits all versions of the PN-2E power nozzle. This model power nozzle came with the E2 Type 12 (e2 Silver, Gold), and the E-2 (e SERIES™) Rainbow. Does not fit the PN-12 power nozzle that came standard with the Black version E2 Type 12. The original 7 foot hose that came out in 1998 looks different compared to the current version. This design came out with power nozzle serial number for the domestic market 7919600 and international market serial number 5978472. Better couplings at the end of hose to lessen stress when bending to prevent holes. Handle improvement for better ergonomics that helps reduce stress on the hand and wrist. Allowing for water pick up for use on the new AquaMate shampoo systems. With this new hose design, it will allow you to use the new AquaMate AM-12 Silver. Allows you to keep your Rainbow unit at the top or bottom of your stairs. No more holding it. Vacuum off your ceiling fan without having to hold your unit while standing on a chair. Keep unit in the middle of the room while you vacuum. This is a factory OEM electric hose for the PN-2E power nozzle. This model power nozzle came with the E2 Type 12 (Silver, e2 Gold Series), and the E-2 (e SERIES™) Rainbow. The original hose that came out in 1998 (Item number R8077) looks different compared to this current revised version. 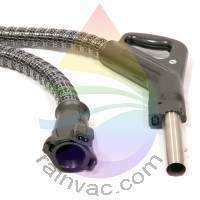 Better couplings at the end of the hose to lessen stress when bending to prevent holes. This version came out with power nozzle serial number for the domestic market 7919600 and international market serial number 5978472. OEM factory original PN-2E power nozzle. This model fits the E2 Type 12 (Silver, e2 Gold), and E-2 (e SERIES™) Rainbow Vacuum. Comes with standard 8 foot electric hose. Brand new with a three year warranty. Height Adjustment: Three position height adjustment allows for efficient cleaning of all lengths and types of carpet . User Friendly: A finger tip power control and an ergonomic grip allows for ease of use on larger carpeted rooms. Sure Lock Power Nozzle Stands On Its Own: The improved upright locking design allows the power nozzle to stand up without a fear of falling. Low Profile: The power nozzle design is very low to allow cleaning under furniture and bed frames. Some power nozzles will have R7869 on the label. This number is the part number for the label itself and not the complete power nozzle head. * Choose your series or version to match your Rainbow. OEM factory original PN-2E power nozzle. 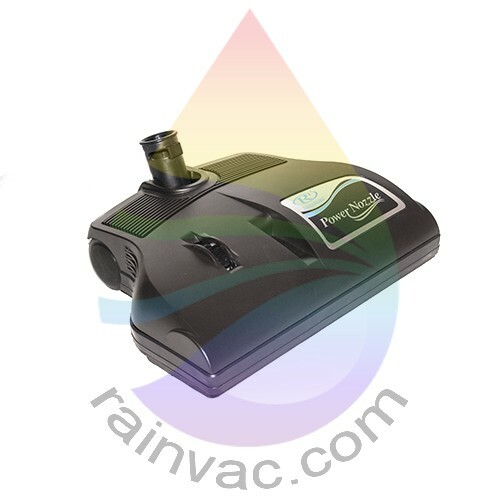 This model fits the E2 Type 12 (e2 Silver, Gold), and E-2 (e SERIES™) Rainbow Vacuum. Brand new with a three-year warranty. This unit includes motor, brush roll, power cord (not pictured), etc....just attach your wand and hose and go to work. Height Adjustment: Three-position height adjustment allows for efficient cleaning of all lengths and types of carpet. User-Friendly: A fingertip power control and an ergonomic grip allow for ease of use on larger carpeted rooms. Note: Includes power cord that runs up the metal wand and plugs into electric hose handle. Some power nozzles will have R-7869 on the label. This number is the part number for the label itself and not the complete power nozzle head.